When will they wield greater political clout? 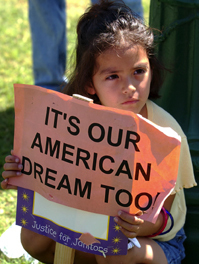 Latinos recently moved ahead of African-Americans to become the nation's largest minority. But while Hispanics already exert enormous influence on American life — salsa is now more popular than ketchup — their political clout has yet to catch up. Some experts contend that the recent defeat of Lt. Gov. Cruz Bustamante in California's gubernatorial election indicates that it may be a decade or more before Latinos' political influence blossoms. But others say growing Latino populations in swing states will bring increased influence in next year's national elections. Meanwhile, some immigration critics favor curtailing the influx of Latinos until those already here are inculcated with American values. But Hispanics say their high rate of English-language fluency — and proud self-identification as Americans — show they already embrace the nation's values.